For gripping drama, Captain Phillips is this fall’s clear leader so far. Sure, Gravity has eye-popping special effects, but Paul Greengrass’ merchant mariner thriller has the benefit of being based in fact. 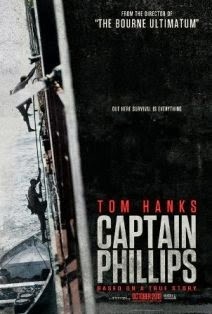 The real Captain Richard Phillips (whose book, A Captain’s Duty, served as the film’s basis) has signed off on the authenticity of the adaptation, including Tom Hanks’ emotionally raw portrayal. Escapism certainly has its place, but nothing beats the jolted nerves that result for knowing a life-or-death situation really happened. 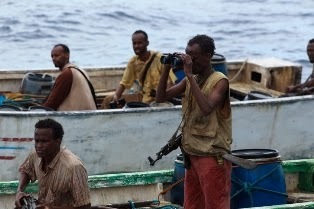 In 2009, the American cargo vessel Maersk Alabama was hijacked by a group of Somali pirates. Most of the ship’s unarmed crew hid out in the engine room while Captain Phillips (Hanks) and a couple of assistants manned the bridge. The pirates, amped up on a continuously-chewed drug called khat, demand far more than the $30,000 cash being offered if they peacefully de-board and go home. 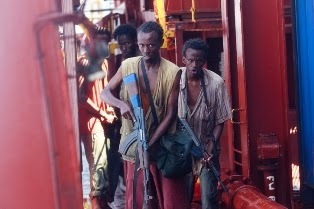 Led by Muse (Barkhad Abdi), these pirates see the hijacking of the ship as their ticket to millions, not to mention the respect of their leaders. No reason to reveal even as much as we see in the film’s theatrical trailer. If you followed the story even vaguely when it unfolded on the news, the outcome is a foregone conclusion. But the tension and suspense that drives the film recalls the earlier “based on a true story” films of both Hanks and Greengrass: Apollo 13 and United 93, respectively. Even though we know what’s ultimately going to happen, the storytelling is so sure-handed that the audience is completely caught up in how that conclusion will actually be reached. Hanks is the only marquee name here. As excellent as he is, perfectly capturing the fear and shock that would likely overtake anyone thrust into Phillips’ position, he doesn’t dominate the film. In an astounding turn (which, if there is any justice, will receive recognition come awards season), Barkhad Abdi not only makes the loose-cannon, self-proclaimed “captain” Muse fearsome but strangely sympathetic. The motivations for some of his actions are not always clear, yet Abdi makes us believe every contradiction. However unlikely it may seem that a gun-wielding, money-hungry pirate can be sympathetic, Muse is (at least to a point). 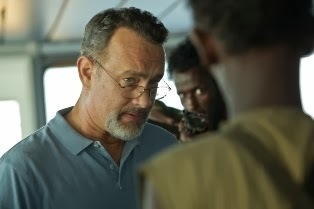 Somehow Phillips and Muse are, at times, able to reach a point of civil communication (delicately handled by Hanks and Abdi) and it is at these points that Captain Phillips is most compelling. One thing Greengrass and screenwriter Billy Ray make clear from the beginning – these pirates know no other option in life except to hijack ships and try to score a sizable bounty. They aren’t going to get rich or gain any real respect in the process, but they may at least be seen as something other than entirely disposable to the overlords and corrupt government officials pulling the strings above their heads. The other three pirates that board the Alabama – Bilal, Najee, and Elmi – are less distinctive, but the actors who portray them (Barkhad Abdirahman, Faysal Ahmed, and Mahat M. Ali, respectively) deserve praise as well for making the best of thinly-written characters. A first-rate dramatic thriller and definitely a highlight of 2013.